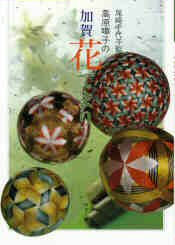 The Japanese books about temari are nothing if not stunning. Obviously most of us are not fluent in the Japanese language, but that does not obscure using and/or collecting the books; the Japanese rely much more on diagram than text in instruction, so much can be interpreted. Many of the books are instructional, while others are presentation/commemorative albums. All are beautifully done. The most accurate way of referring to or identifying the books is with the ISBN numbers, even though we do have accurate English and Romanji translation. It's recommended that to be absolutely certain when referring to a Japanese book, you include the last 4 digits of the ISBN. 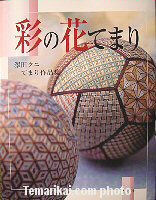 There are several sources for Japanese books, but our primary one is Ai's Temari Store (Kobe, Japan). You may be able to find them elsewhere on the web; cities with larger Japanese populations will often have Japanese book stores, worth checking out. Remember that these are Japanese books, in Japanese format: Japanese language (Kanji and Kana, not Romanized), and most read right to left, top to bottom (exceptions are noted). 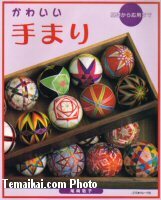 They are still wonderful for any temari maker; the diagrams in some books are so well done even beginners can benefit from and enjoy them though I suggest becoming a bit familiar with Temari using English resources before trying the Japanese books. The directory is meant to be as complete a reference bibliography as possible to date, including out of print as well as currently available (the last known availability is included in each review). Entries prior to March 2014 (the majority) are listed in alphabetical order by translated English title. New titles added after March 2014 follow the initial listing (see page 2 of the listing). Each entry includes a brief content review and difficulty level. This is an extensive/comprehensive listing; as of December 2014 it has been divided into multiple pages. Each set will print (multiple pages, depending on scaling) in notebook format (right click and print). For a quick and concise list, try the Japanese-English cross reference. Shygyoku means gems or jewels; Azuma is the name of the group: The Japan Temari Cultural Association (differs from the JTA). Intermediate to advanced designs; photo groupings showing various renditions of a selected design; does not include basic instruction. 12 pages of pattern design instructions, but more a presentation book. ISBN4-5290-02782-1 Copyright 1996, 104 pages, soft cover; Out of print. Also known as the "Olympus Purple". Great, diagrammed beginner/intermediate book. Includes photos and diagrams to make a mari, and to work vertical, C8 and C10 divisions. Good pattern diagrams for the patterns included cover most of the basic stitches. This is one book that is published in Western format. Good to learn from scratch, also for beginner to intermediate stitchers. Cover to the right is the old edition. A more advanced book for intermediate to advanced stitchers. The book is presented in two sections, the first being seasonal event- and festival- themed designs. The second section focuses on color groupings as well as design groupings. Some of the patterns represent the work of recently certified JTA members from TalkTemari and other groups. ISBN 4-8377-0203-1 Copyright 2003, 47 pages, hardcover. Out of print. This is a beautiful presentation of photos, mostly multiple face floral designs; wonderful eye candy to appreciate and admire. The patterns are intricate, and might be interpreted by advanced stitchers but there are no working design instructions. A slim book, very basic for scratch learners and beginners. Step by step photos for making mari, working vertical divisions, then adding an obi. Stitching instructions for basic stitches and divisions. These elements are all learned by working a ball with them. A few other patterns to use your skills are included at the end. First book of the Cosmo Series (Cosmo is a thread brand underwriting the series); focuses on Simple Division and the basic stitches. Great beginner book but experienced stitchers should have it in their library too. Loaded with photos showing step by step process. Second in the Cosmo series picks up where Cosmo 1 left off in teaching basics. This volume includes step by step instructions for C8 and C10 divisions, and assorted patterns using these divisions and elements with several techniques. Again a beginner to intermediate book, but good investment for all. The third book of the series settles into regular format of the remainder of the series. Not an instruction book but one of patterns. This volume concentrates on 8- and 10- Combination Divisions, and the patterns are mainly geometric but also includes lace-like stitching designs. Various techniques are included in the design work; good all-around book for everyone. Fourth in the series. Focus of patterns is on wrapped designs and all-over patterns. Good for intermediate to advanced crafters. Fifth book in the Cosmo set. Broad range of pattern designs for intermediate to advanced crafters. Many designs are focused on geometrics and/or florals, combination divisions. Sixth in the series, good for advanced beginner on up. Mostly geometric patterns; about half focus on using squares in various forms and orientations, and another good overall collection of patterns on the upper intermediate to advanced level. The last in the Cosmo Series. A good range of design types, including a collection of patterns focusing on Matsuba Kagari (straight stitches). Intermediate to advanced stitchers. Sousaku means creative, zikushi means everything; beautiful mix of all types of patterns and techniques. Includes florals, geometrics, free embroidery, patchwork, applique, and ribbon embroidery, several Temari eggs, crane interpretations, lace interpretations. Includes 2 pages of detailed mulitiple-faced marking. For accomplished intermediates to advanced. privately published by the Japan Temari Cultural Association, 1998. An anthology of 10 members' work showing exquisite designs. There are no patterns in this book; for the advanced stitcher a wonderful source of inspiration and analytical study. For everyone, a beautiful publication to admire. 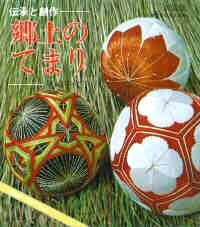 privately published by the Japan Temari Cultural Association, 2000. An anthology of a workshop showing exquisite designs. There are no patterns in this book; for the advanced stitcher a wonderful source of inspiration and analytical study. For everyone, a beautiful publication to admire. 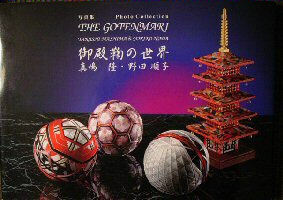 privately published by the Japan Temari Cultural Association, 2010. A commemorative photographic album of members' work showing exquisite designs. There are no patterns in this book; for the advanced stitcher a wonderful source of inspiration and analytical study. For everyone, a beautiful publication to admire. Great selection of designs; florals, geometrics, pictorials. Includes some Christmas motifs, cranes, character images. Some color collections of black and white and also indigo and white temari. Summary page of divisions and stitch basics. but no detailed instructions for basics. Intermediate to advanced level. Geometric and nature-inspired designs, including snowflake, dragonfly, stars... a beautiful collection of patterns. This book uses DMC threads, upper intermediate to advanced level. Introduces multiple-face markings. Intermediate to advanced level projects. Naniwa is a temari group in Osaka area; Miyako is a different temari group. Florals and geometrics. Includes Temari made with applique, ribbon petals, free embroidery, etc. offer a unique twist on creativity. Several pages of "stained glass" balls. Accomplished intermediate to advanced level. Nyumon means beginner; hana means flower. Beautiful floral patterns with some geometrics. Color collection of indigo and white. Good diagrams showing subsections of divisions; excellent diagrams of stitches and pattern elements. Good for experienced beginner to advanced stitchers for both patterns and reference. Another superb collection of floral designs worked in many different methods. There are a few geometric patterns, and also includes multiple patterns that resemble stained glass. Excellent diagrams showing multiple face markings, additional markings on C8 and C10, as well as a color illustrated summary of stitches. Most are advanced level designs, but intermediates with dedication could work some patterns. Kyoudo means hometown. Mostly geometric designs, general variety of techniques, for beginner to intermediate. Includes chart of vertical, C8 and C10 possibilities. This is one of 6 or 8 Japanese books published in a smaller, square format. Tanoshii means pleasant, fun, merry... asobi means playing. This book is a comprehensive covering of all basics in a manner that is easy to follow. There is a large offering of patterns of many styles. It spans the distance between beginning and more advanced stitchers. There are summary pages that show the variations of skills and elements to let your creativity expand. If you were to own one Japanese book, this is the one. This is an older, most likely privately published (no ISBN) book focusing on temari made by the ladies of the old court or palace. These were usually stitched with silk thread. Other than a set of color plates with photos of the temari the remainder of the book is in black and white; a few black and white photos are used for instruction but most is hand-drawn sketch. This is a beautifully done album book (no patterns) of temari created to illustrate Tale of the Genji, Children's Songs, a selection of art, and the Life of a Woman. Kabuki - that is, literature, theater, art, and life. Commentary accompanies the photos, in both Japanese and English, and the book is published in Western format. Copyright 1973, 66 pages, soft cover; out of print. 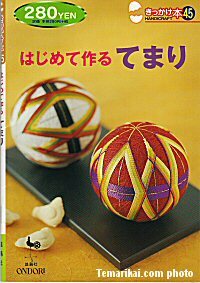 This is one of a series of general handcraft books, this volume being about temari. Beginner books with good diagrams and photos of the basics. Also issued with cover shown at right. While not specifically temari, this book of mobile making does include them. There are limited instructions for making temari shown as part of the mobiles. It also includes modern-day kimekomi, chirimen dolls and figures and felt figures. Full size patterns for dolls and figures; some temari instructions and patterns. A beautiful hardcover book, referencing all the prefectures of Japan and indicates what prefecture every temari came from. It presents a history of Temari design - starting with older, less intricate ones through absolutely stunning more modern ones. A very wide range of fibers is shown. This is not a pattern book. This book would be appreciated by any Temari lover for both study and utter enjoyment through appreciation of the photos. 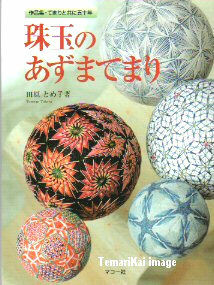 This is an album of work, directory, & overview of the Japan Temari Association (founded in 1979). It is very much a keepsake book, in a slip-cover and box. Exquisite temari photos linked to biographical inserts of Japanese Temari members at the time of publication. Temari from the Kii region and temari from the Owari & other regions of Japan. Fabulous color combinations and stunning designs; all styles - florals, geometrics, pictorial embroidery, woven, and layered designs. For advanced stitchers. While the text is in Japanese, the book is in Western format. Aimed at beginners, but a few designs are more intermediate to advanced level. Temari is presented in a more updated, modern format. Includes some teenies, Christmas decorations and jewelry projects. Published in conjunction with Fujix Threads/Fibers of Japan. When my newer students inquire about a Japanese book, this is the one I suggest. 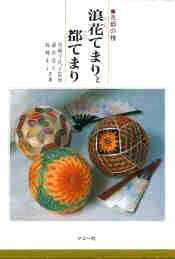 Temari are often displayed as mobiles, which is the focus of this book. Directions and patterns for a variety of temari, of various levels of difficulty. 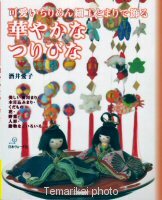 It also offers instructions for making the mobiles, as well as the accessories used in the mobiles such as knots, chirimen dolls and woven bamboo balls. Includes some Christmas designs and yubinuki. Nicely diagrammed. Musashino is the old name of the region of Japan where the author resides, and a group name. Designs in this book are stunning & intricate; advanced to very advanced levels. Excellent color diagrams for plotting multi-face patterns. Watashi means my, nyumon means beginner. Very basic, solid presentation of techniques to start crafting temari. Easy to follow photos and diagrams - a good beginner/learning book. ISBN4-277-49045-X Copyright 2005, 44 pages, soft cover; Published by the Ondori Co.
Ondori Handicrafts book series. A good basic, beginning instruction book. Japanese text, with many and good photos and diagrams of basic techniques. Small format, book measures 5 3/4 x 8 inches. Owari is a region in Japan. Great selection of patterns, in addition and the best book for this color illustrations showing dividing and marking as well as many sub-sections and marking variations. Photos of Temari made using these markings are included on the same page. Suitable for accomplished beginner to advanced stitchers. Good reference, teaching and inspirational book. 20 pages of bound postcards (40 cards in all) each with a photo of a Temari grouping of 4-5 balls, and 16 pages of instructions with diagrams. Few patterns in compared to photos. The postcards would well stand up to framing if one were of the mind to remove them from the book. 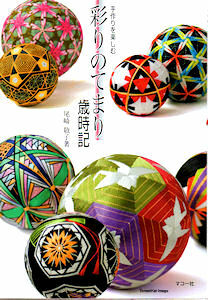 Good for Temari lovers of all levels, but not to be considered an instructional book. This is a TemariKai.com Printable Page; © 2014, all rights reserved. Click to print one copy for personal use. Last updated 12/2014 © 1998 - 2014 TemariKai.com, G. Thompson/PuffinStuff, Inc.